If you are looking to install a new floor in a water-prone area such as the kitchen or bathroom, you ideally want a floor that can withstand the occasional water spill. The last thing you want is to lay a brand-new floor and watch it become warped over a short space of time thanks to moisture absorption. So what are the options for water-resistant floors? 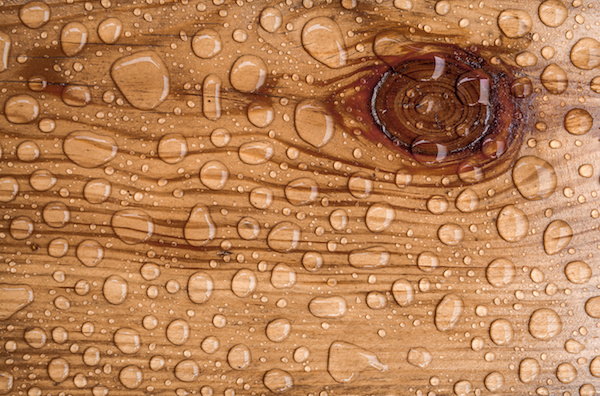 If you want to achieve that wood-look in your water-prone areas, laminate is a great choice. Though not 100% waterproof, it is resistant to water as long as spills are cleaned up quickly. One brand worth considering is Quick-Step Impressive Ultra which offers laminate with a HydroSeal protective coating, meaning that any surface water will gather on the boards rather than seeping into the cracks. It is then quick and easy to wipe up, no damage done. Not only is cork a sustainable option, it is also warm and comfortable underfoot and can have great water-resistant features. ReadyCork is a prime example – a thick layer of moisture-resistant fibreboard is built into the natural cork appearance. The floor is also installed over a sheet of plastic which acts as a barrier against those water spills. If you have a higher budget and are searching for a water-resistant floor that is also incredibly visually appealing, luxury vinyl plank is a great option. It is a popular alternative to hardwood and has that water repelling feature than is not shared by natural timbers. It has the look and feel of a wood floor whilst still maintaining the comfort and warmth of vinyl. Unlike laminate and cork, one of the biggest advantages of vinyl is that it is 100% waterproof and therefore ideal for moisture-prone areas. The Quick-Step Livyn range offers a number of different designs that give an authentic wood look without the worry of planks expanding or contracting. Livyn floors have a strong vinyl core so they can withstand water spills more than most other flooring materials. For more information on installing a water-resistant floor, contact one of our friendly, knowledgeable professionals at Get Floors.